Please view our Delivery Page for full information on local and Nationwide delivery. There are 3 ways to place an order, via the online store, over the telephone, via an email or text. We will call customers who order via email or text to confirm order and take payment. Payment can be made on delivery by credit card, cheque or cash. Which types of payment does Deals2Build accept? 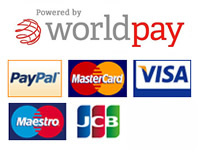 There are several methods of payments, the most popular being credit/debit card via Paypal which are both totally secure, we accept cards via our website at checkout, over the phone or in person with a Paypal chip and pin machine. In addition, payments can be made by cheque, bank transfer or cash. Our prices on the website show the price including and excluding VAT, you will be charged Vat on checkout. All purchases will be given a Vat receipt. Can I use the Deals2Build website securely? Our online checkout uses Paypal which 100% safe, you do not require a Paypal account to make purchases, all you need is a debit or credit card. Dals2Build never pass any details onto a third party and keep your details 110% private. We also ensure that you checkout in a secure environment using Secure Socket Layer (SSL). This way you will never accidently reveal any personal information on Deals2Build using an insecure connection. Does Deals2Build Offer Trade Accounts? We don't currently offer trade accounts, this is due to our excellent prices, long term credit accounts would increase these great discounts. We Hope you are entirely satisfied with your purchase from Deals2Build however, in the unlikely event that you are not, or you have simply changed your mind, please notify us on 07788 536146, for a returns authorisation. Once you have obtained an authorisation code, simply return the item in a saleable condition, within 14 days of the date of despatch, shown on your delivery note. Once the item has been received at our warehouse, we will refund the cost of the item that has been returned. In the unlikely event that your order is damaged on receipt, then please contact our customer us as soon as possible. We advise that all orders are inspected on the day delivery and any damages or shortages are reported to us on the day of delivery. Any faulty goods must be reported to us within 7 calendar days of receipt. Items over 30 days old are covered by the manufacturer’s warranty.